CRASHING HOLLYWOOD is one of my favorite Lew Landers "B" films seen to date, an engaging, sprightly comedy. 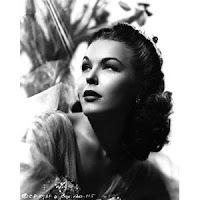 It ranks at the top of my Landers list along with the director's FLIGHT FROM GLORY (1937) and DOUBLE DANGER (1938). Michael Winslow (Lee Tracy of BLESSED EVENT and BOMBSHELL) is an aspiring screenwriter who hooks up with a newly released ex-con, Herman Tibbets (Paul Guilfoyle), to sell Wonder Pictures on what becomes a popular series of crime films. 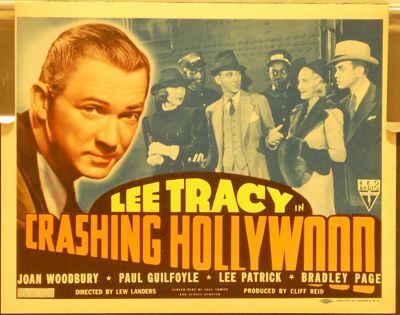 The movies meet with great success; there are just a couple of problems -- the crime depicted in one of the "Hawk" films contains details from a real unsolved robbery, and lead actor Tom Darcy (Bradley Page) is a dead ringer for the actual crook (also played by Page). I found the movie appealing right off the bat, as I love "train movies" and the opening scenes are set on a beautiful train; love that club car! The movie just gets better from there, filmed all around the RKO lot, which stands in for Wonder Pictures. CRASHING HOLLYWOOD is filled with good lines and amusing situations; I was particularly tickled by Richard Lane as fast-talking production head Hugo Wells, whose solution to any problem is to offer a studio contract. His constant refrain to Winslow is "Eight pages a day!" One-time crook Tibbets' dream of being a duck farmer also leads to a couple cute scenes. Young Jack Carson plays the director of the latest Hawk film in the final scenes. The cast also includes Lee Patrick as Tibbets' wife, Joan Woodbury (seen at left) as Winslow's young ladylove, and Tom Kennedy, George Irving, Frank M. Thomas, and Jimmy Conlin. Willie Best turns up for a few seconds as a train porter. The film was shot by Nicholas Musuraca and Frank Redman, who both worked on other Landers films. The well-constructed script was based on a play called LIGHTS OUT. This movie has not had a video or DVD release; hopefully it will be out in the future from the Warner Archive. It's been shown on Turner Classic Movies. CRASHING HOLLYWOOD is 61 minutes of "B" movie fun. Recommended. 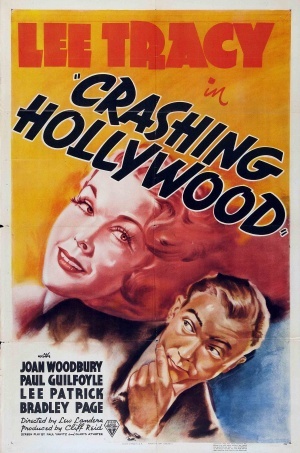 July 2016 Update: CRASHING HOLLYWOOD is now available on DVD from the Warner Archive. My review is here. Films directed by Lew Landers which have previously been reviewed at this site: NIGHT WAITRESS (1936), WITHOUT ORDERS (1936), FLIGHT FROM GLORY (1937), THE MAN WHO FOUND HIMSELF (1937), DOUBLE DANGER (1938), SKY GIANT (1938), SMASHING THE RACKETS (1938), TWELVE CROWDED HOURS (1939), CONSPIRACY (1939), STAND BY ALL NETWORKS (1942), and THUNDER MOUNTAIN (1947).